Vote forSunshine Coast, QLDTop Major Destinations Which are Australia's must-visit destinations? You help us decide. Known for its beautiful weather, great beaches, fun attractions and plenty of wonderful outlooks, Queensland’s Sunshine Coast more than earns its name. South to north, there are over 70 kilometres of white surf beaches stretching across the Sunshine Coast, with plenty of awesome breaks offering clean waves in numerous locations, meaning both surfers and beach lovers in general will be in their element here. Combine all its positives and you’ve got one of Australia’s most family-friendly destinations. The “Sunny Coast” as it’s known colloquially also provides a pleasant blend of scenic and nature-based activities throughout its reaches that can prove equally beautiful – and yet far less crowded – than other similar holiday hotspots, with not just its beaches but a series of lovely rivers and waterways that make for excellent boating, fishing, swimming and much more. Situated within an easy drive from QLD’s capital Brisbane, it thus serves as one of the most popular escape spots in South East QLD. Whether you’re staying at the popular suburbs of Noosa, Caloundra or Mooloolaba, you’ll not only enjoy the spectacular beachfront atmosphere but also find plenty of non-beach related activities to take part in as well. As perhaps one of Australia’s best family-friendly destinations, there are a number of great things to do here for those bringing the little ones along for the journey, and as such the Sunshine Coast was recently voted one of our “Top Places in Australia to Travel with Kids” for 2013 and 2014. Attractions – both man-made and natural alike – abound, from perhaps the most famous wildlife park in Australia, the late, great Steve Irwin’s Australia Zoo, to popular aquarium UnderWater World, to the wonderfully lush hinterland with its impressive Glasshouse Mountains and quaint mountain villages of Montville and Maleny that offers a great atmosphere combining rainforest with an English-style town. Diversity is the name of the game here, and it shows. Couple all of the above with its vibrant and diverse markets at Eumundi which are some of the most impressive in all of Queensland and a must-visit for anyone looking to snag a bargain or taste some local produce, and you’ve got a region that offers tremendous variety in food, activities and attractions to go along with its great climate. As a destination with a laid-back atmosphere, cheerful disposition and impressively clean nature of all kinds, the Sunshine Coast makes for a solid entry on any Aussie top destinations list – there are few things as a travel destination here to fault and thus it’s easy to recommend to holidaymakers of all dispositions and demographics. Looking to pay a visit to the Sunshine Coast but not sure what to do? Here are some of its most essential experiences. What's new on the Sunshine Coast in 2016/2017? Need more info on Sunshine Coast? Check out our detailed travel features on this top spot below. Despite a relatively small population, the Sunshine Coast is far from lacking for things to do for all ages. We highlight ten of the region's absolute must-do experiences in detail here. It's the eternal battle of south-east Queensland holiday destinations: the Gold Coast or the Sunshine Coast, which is better and why? We dive into this holiday showdown here. Not merely a family holiday spot, the Sunshine Coast is home to a burgeoning restaurant and culinary scene as well. We outline ten of the top spots to enjoy a meal in detail here. 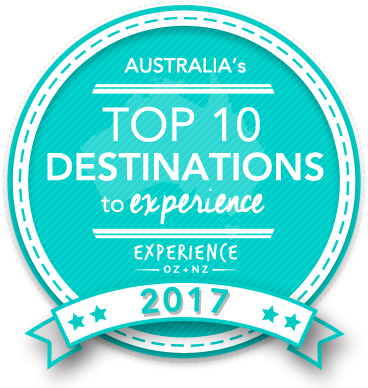 Is Sunshine Coast Australia's Top Major Destination to Experience for 2017? Vote now for the chance to WIN an epic trip to one of Australia's top destinations!